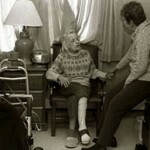 HealthSET is dedicated to improving the lives of the low-income elderly. Our highly-skilled and compassionate nurses and case workers provide free health clinics and substantial follow-up care, acting as a bridge to the complex health care and social service systems. We give our most vulnerable seniors the tools to live independently, which is key to preserving their quality of life. It is only through the generosity of our donors and funders that we can accomplish our work. HealthSET is funded entirely through grants and contributions. Thank you so much to all of you for being essential partners so that together we may improve the lives of low-income seniors.